See what the symptoms of kidney cancer can be, and when you should see a GP. Your symptoms are unlikely to be cancer, but it is important to get them checked by a doctor. 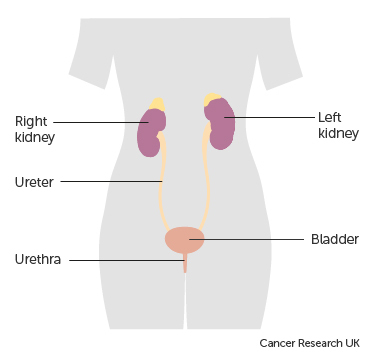 Blood in the urine (called haematuria) is the most common symptom of kidney cancer. About 50 out of 100 (50%) of people diagnosed with kidney cancer have it when they first go to the doctor. It might be caused by an infection, enlargement of the prostate or kidney stones. Always see your GP if you notice any blood in your urine. The blood does not have to be there all the time. It can come and go. Sometimes, the blood cannot be seen by the naked eye but can be picked up by a simple urine test. As the bleeding can come and go, you or your doctor may think that the problem has gone away. This can mean that an early, treatable cancer in the kidney or bladder is allowed to grow to a stage where it may be more difficult to treat. If you feel a lump or swelling in the area of your kidneys, go straight to your doctor. Most kidney cancers are too small for you or a doctor to feel. But your doctor can arrange an ultrasound scan to check for cancer. A high temperature and sweats can be caused by an infection. Your doctor may want to rule this out first. High blood pressure and having fewer red blood cells than normal (anaemia) can also be symptoms of kidney cancer. These symptoms are related to the hormones that the kidneys produce. These symptoms can be caused by many other conditions. Most people who have them will not have cancer. But if you have any of these symptoms, go to your doctor for a check up. If it is cancer, it will be easier to treat if it’s diagnosed early.